A gallant 10-man Adelaide City outfit have fallen 1-0 to Campbelltown City on Saturday afternoon, sending the Red Devils to their second NPL SA Grand Final in three years. The result means that City now must overcome MetroStars on Saturday night if they are to progress to the September 1 clash at Coopers Stadium. The Black and Whites started aggressively as they moved the ball nicely around the park. 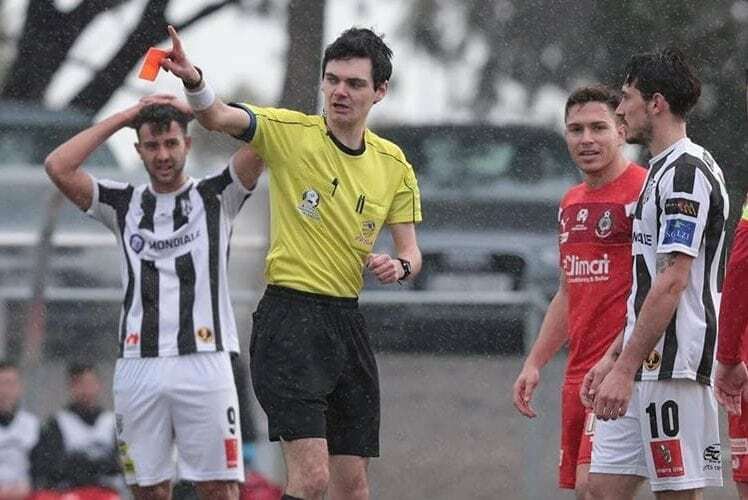 However, they were dealt a major setback just nine minutes in as referee Aaron Galanti controversially red carded City forward Evan Kostopoulos. Campbelltown’s Adam Piscioneri tussled with Kostopoulos in the middle of the park as the latter appeared to push Piscioneri in the chest. The Campbelltown player dropped to the surface and Galanti pulled out the red card with no hesitation. It was then an uphill battle for the visitors, who defended resolutely for the remainder of the first half, with Joseph Costa’s freekick whistling over the bar which would have given them an unlikely lead. The two sides entered the break deadlocked at 0-0, with both teams exchanging chances throughout the half. But it was City who came closest to stealing the win with one minute remaining, through Joel Allwright. Allwright collected the ball inside the final third and took on two defenders before firing a shot destined for the bottom corner. However, Campbelltown gloveman Nik Harpas was able to get down well and parry the ball out for a City corner. Anthony Costa got on the end of a poor back pass, with Harpas again coming to the rescue for the Red Devils. The save meant that the game went to extra time, with City’s boys looking tired after playing over 80 previous minutes with one less man on the park. After some gallant defending by City, it was Campbelltown who finally took the lead through Alex Mullen. Yohei Matsumoto ran down the right hand flank before cutting back into the penalty area, and it was Mullen who slotted home from the edge of the 18 yard box. City continued to press in search of a late equaliser, and right at the death Anthony Costa was brought down in the area, however Galanti waved play on, sending Campbelltown through to the Grand Final.